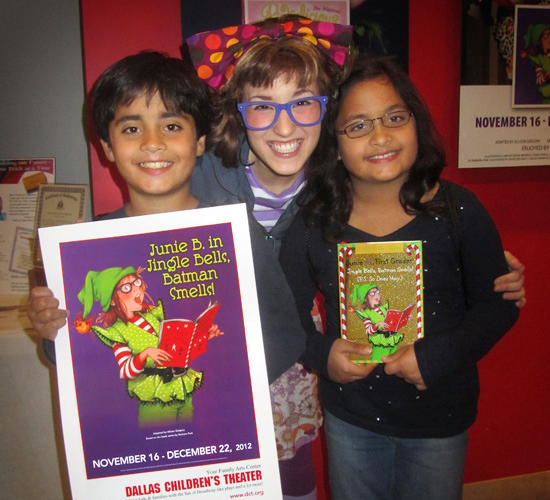 We caught a recent performance of Junie B. in Jingle Bells, Batman Smells at the Dallas Children’s Theater. It’s a light-hearted show that the whole family can enjoy and will make you laugh out loud! As the performance opens, it’s the last week before winter break and Junie B’s class in Room One is about to participate in a Holiday sing-along. The class has also been chosen to lead the entire auditorium in a chorus of “Jingle Bells.” Nervous about the upcoming show, Junie B has a flashback to last year’s disastrous performance of a Columbus Day play when her arch rival May tries to take over and chaos ensues. 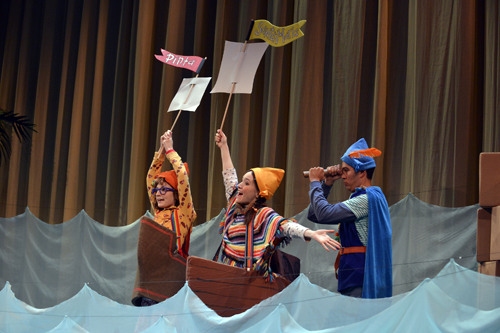 The Columbus Day skit, a show within a show, is FUN and wonderfully portrayed by the cast. I especially liked the creative use of silk-like fabric to represent roiling ocean waves. Junie B’s angst intensifies when she realizes that she has drawn none other than May to be her Secret Santa pal in the class gift pool. The plot thickens when the class browses through the gift selections later in the day. Junie B spies a special toy that burps out loud. The “Squeeze-A-Burp” is a BIG hit with all the kids in the class. Although she plays down her interest in the “Squeeze-A-Burp,” secretly, Junie B really wants the toy for herself . One of the later scenes has a giant “Squeeze-A-Burp” that kept the audience in stitches with loud belching resonating through the theater. Our son LOVED this part! Here’s a fun fact: Originally, the giant “Squeeze-A-Burp” was supposed to be a stationary prop for the show. Scott Zeinreich, who plays Sheldon, decided to hide inside the prop one day as a joke. It worked out so great that the giant prop evolved into an actual character in the show with its own scene. Here’s Junie B giving him a big, burpy squeeze! Junie B’s desire for the “Squeeze-A-Burp” and her aversion to nemesis May prompt her to discuss her dilemma with her stuffed elephant; they come to the conclusion that a lump of coal is the perfect gift for May — yikes! At this point, I wondered if there would be a positive message for kids to learn from the show and I was not disappointed. 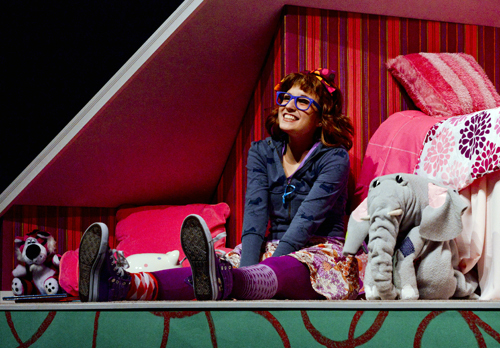 Although most of the performance is designed to showcase the rambunctious behavior of Junie B, including her hilarious monologues via entries in her journal, the audience will appreciate the character’s authenticity and struggle to make the right decision. The cast of Junie B. in Jingle Bells, Batman Smells played their roles so realistically that I, many times, forgot that they weren’t actually first graders! 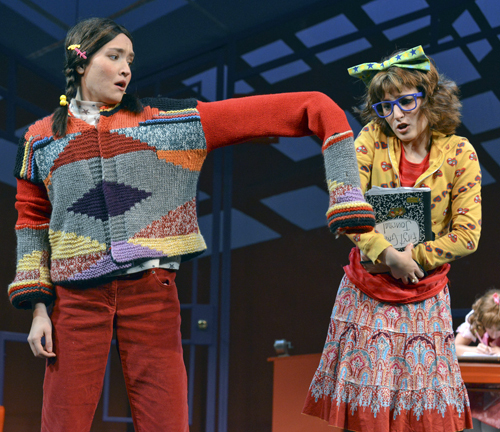 Mary McElree and Shelbie Mac, real life sisters, really shined in their roles as Junie B and May. They played off each other wonderfully. Also quite lively were Scott Zenreich as Sheldon and Karl Schaeffer as Mr. Scary. It was entertaining to watch dramatic outbursts and physical comedy of these two characters. I loved the eclectic look of the costumes, down to the mismatched socks. I did miss the usual musical scores that we’ve come to enjoy in other DCT productions, but the cast does do a couple of Christmas carols at the end of the show, including the infamous “Jingle Bells, Batman Smells” rendition of “Jingle Bells” — nice way to top off the evening. During the post show autograph session with the cast, I realized that I had completely forgotten to bring my twins’ Passport to Imagination, a fun booklet with activities, room for autographs and a special area for kids to collect passport stamps from each show (free to Season ticket subscribers and also available for purchase). 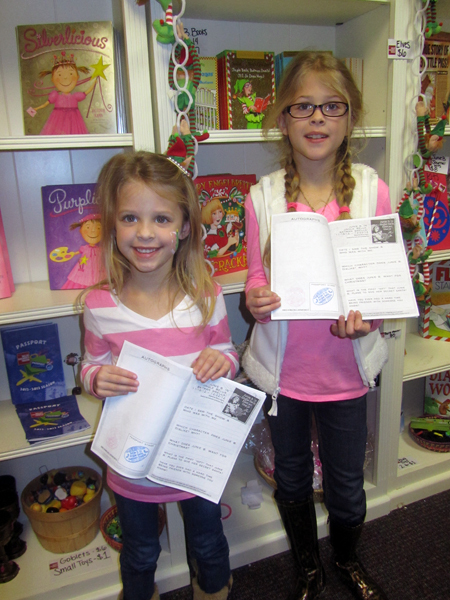 Luckily, these young ladies’ mom didn’t mind me sharing a photo of them and their booklets after they were stamped. Our twins got their book we purchased and their show posters signed instead, which was great. 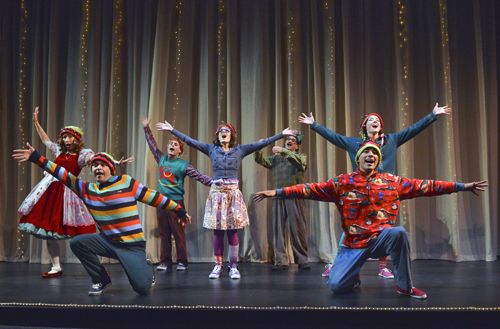 Dallas Children’s Theater planned a fabulous Winter Wonderland celebration for opening night. There were Jazz singers from Booker T. Washington High School, kids activities and a special visit from Santa! 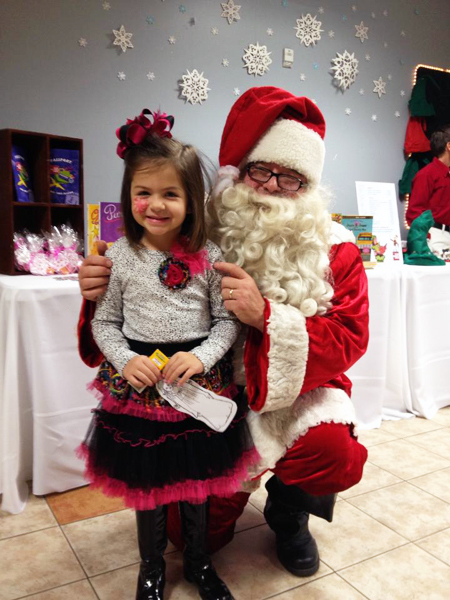 Here’s a young lady who loved telling Santa all about her wish list! The scenery in the lobby was neat. 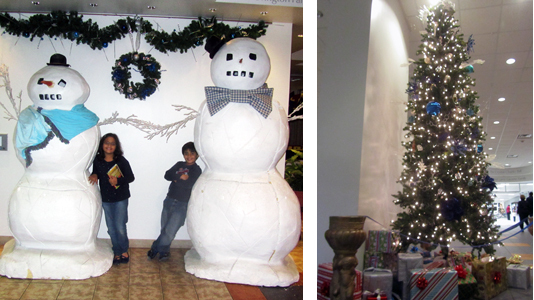 Check out these HUGE snowmen and the Christmas tree. Junie B. in Jingle Bells, Batman Smells is hilarious and your family will enjoy it. Take in a show before the performance run ends on December 22nd. If you’ve already seen it, you can also catch DCT’s other Holiday show, The Nutcracker, playing through December 23rd. Check out my review of The Nutcracker. Visit www.dct.org for more information and to purchase your tickets. 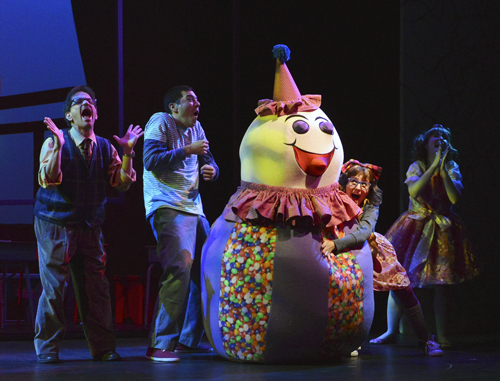 You can also catch up with Dallas Children’s Theater on Facebook. Mina Frannea is a web editor and social media professional. Also a mom to nine-year-old twins, Mina enjoys writing about family friendly activities around town, and issues that are relevant to Moms and raising children. Mina also enjoys sharing favorite recipes and activities that keep her children busy and happy. Visit Mina’s blog at www.themomsjournal.com. Disclosure: Dallas Children’s Theater invited my family to this performance of Junie B in Jingle Bells, Batman Smells. The above represents my personal opinion of this production.